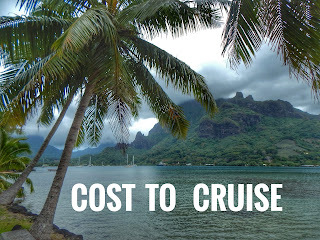 A few notes about this months cost to cruise. Groceries: Tahiti was the first "real" place we could buy food. "Real" meaning there was an actual grocery store available, not just little overpriced markets like what we experienced in the Tuamotus. As we walked through the doors of the local grocery store we could almost hear angels singing. The four of us stood in awe at the mounds of fruits and vegetables trying not to drool on ourselves. And then there was "real" cheese for purchase...not just the government cheese we had been eating. We went a little wild and spent some extra money on groceries this month. Butane: It can be difficult to find propane in certain parts of the South Pacific. Part of our 'supplies' cost this month was buying a fitting for our propane tanks to be able to gravity fill them with butane. Other cruisers were able to have their propane tanks filled but it cost them 3 times as much versus had they filled them with butane. Amazon/ Supplies: While in French Polynesia we decided it would be best to use the availability of the US Postal service and have items sent to American Samoa. We ordered supply parts (head part, outboard parts, tablet, Android cords, oven part, etc.) off Amazon and other suppliers and had everything sent to South Carolina. Once in South Carolina, Phil's mom repackaged everything into two Priority Mail packages addressed to American Samoa. Our packages were sent on a Tuesday and ready for pick up that same Saturday! Using US Priority mail is the way to go and doesn't cost any extra to send items to American Samoa versus anywhere else in the continental US. **Before heading to the South Pacific, load up on anything electronic. We've purchased extra Lenovo tablets as back ups for when our other tablets crap out. Another good idea is to purchase 10-20 extra chargers for your devices. Amazon sells 10 chargers for $12. Your electronics and chargers don't stand a chance in the elements. Question- when shipping to American Samoa, how do you label your package and where do you send it? Thank you! All mail for the island is picked up at the post office right in the middle of town.